Have a Christmas party that’ll make Santa himself look like a boring old fuddy duddy! 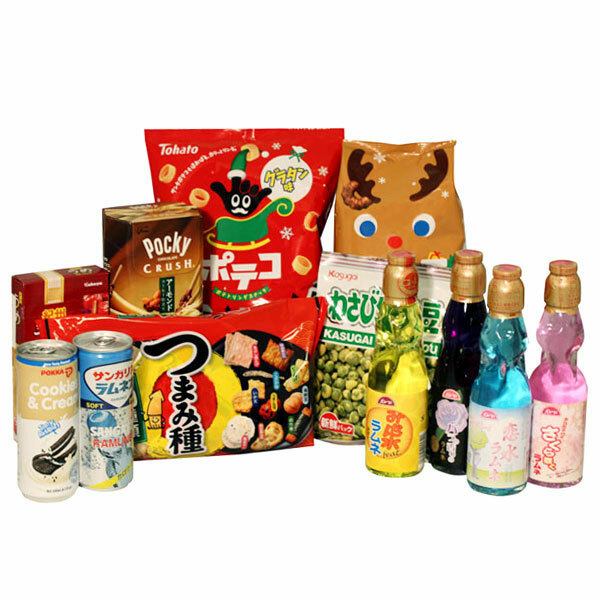 Our Christmas Party Hamper is packed full of dazzling and vibrant bits and pieces that combine to make the ultimate party selection, including limited festive snacks and bubbly ramune drinks. Japan Centre fans from anywhere in the EU* can enter this cracking Christmas competition. What Japanese food would you give Santa-San? We will choose 1 winner at random on Thursday 11th of December. 1) *Week 2 – Christmas Party Hamper winners may have delivery addresses in any EU country to which JapanCentre.com ships. 2) Japan Centre will choose a winner at random after the closing dates on Thursday 4th December, Thursday 11th December, and Thursday 18th December. If no response is received from the selected winner within 7 days a new winner will be chosen from runners-up. Posted in Uncategorized and tagged christmas, competition, japan, Japanese Christmas food, Japanese Christmas Party. Bookmark the permalink. Wow, I would give Santa some Takoyaki, but made over Christmas themed, so probably with a turkey filling! I would give Santa-san some home made Taiyaki in the traditional fish shapes complete with santa hats made from royal icing ^_^! Hard to say, do raindeer like gobo? Is so then kimpira gobo for the raindeer and some warm amazake for Santa. As a snack, maybe dorayaki? Our homemade special Sushi with unique fillings, of course! Ichigo Ame – red, sweet and festive – just like Santa-san! I would give Santa-San some chicken katsu curry to fill him up and give him energy to climb those chimneys! I would give Santa-San Taiyaki as it is warm and sweet to give him energy for long hourney. I would give Santa-San chirashi-sushi: something quick and easy so he can get back to delivering presents faster! Pocky! Because it’s kinda the same idea as cookies and i mean c’mon who doesnt like pocky? In my home Santa-San will get the best black sesame crème brulée ever with matcha ice cream to finish. oishii!! I would give Santa san a bowl of Tonjiru!! I’ll give Santa-san some amazing KFC. Because if everybody in Japan is doing the same, why not set the tradition with Santa-san? I would leave him some tasty mochi! I would give Santa-San some Swedish inspired pickled herring sushi rolls with a selection of red, white and brown cabbage on the side! I’d give Santa-San some sata andagi to fill his belly and some hot sake to keep him warm! I think I would leave him one of the little packs of pocky! So he can take it with him , maybe the milk flavoured one yum! I would have to make Santa-San Christmas pudding style mochi, with a rich brandy centre (but not too much while he is working). Accompanied by a delicious shot of sake. I also would have carrot flavour Pocky sticks ready for his noble steed reindeers! Santa has worked hard all night. It’s cold. He’s hungry. There’s only one food for him: a steaming bowl of Oden with a crisp Yebisu lager. Umai! Otsukaresama! Sake for Santa San and Cooked rice for the reindeer. Red bean mochi and warm sake. I’ll give Santa-san Dagojiru – Kumamoto/Oita style miso soup with floury noodle 😀 It’s lovely for cold winter night! Mmmm, cinnamon spice matcha and mincemeat dorayaki??! How about a plate of good old bangers and mash. The Japanese curry is delicious and comforting during a cold winter evening, so I would be happy to be able to offer a generous portion to Mr Santa! I would give santa a warming matcha latte so that he can brave the cold again! I would give santa a warming matcha latte so he can brave the cold again! Some cookies and cream soda for sure! Dashi thru the Soy with a Chicken Katsu Curry. Oh what fun it is to eat from the Japan Centre Store! Japan Centre, Japan Centre, Japan all the way! Oh what fun it is to eat from the Japan Centre Store! I’d give Santa-San a nice filling bowl of katsudon. I would lack Santa-san with a super kawaii bento depicting Rudolph with a plump umeboshi for his red nose. Ichigo Daifuku!! This delectable strawberry-filled mochi can double as a pillow to keep Santa comfy on his long sleigh ride, then when he gets hungry he can have the tastiest Japanese treat EVER!!!! !